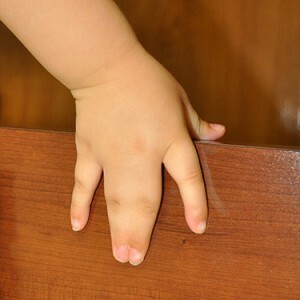 The presence of webbed fingers in children, syndactyly, is a condition often seen by Dr. Nicholas Bastidas. Dr. Bastidas is a board certified plastic and reconstructive surgeon with specialized pediatric training, preparing him to perform a wide range of surgeries on both children and adults. The presence of webbed fingers in a baby is often not a do to genetic inheritance. Webbed fingers are caused during the sixth to eighth week of intrauterine life by the failure of the normal longitudinal digital necrosis to occur in the tissue, thus presenting a web-like appearance to a baby's fingers. Webbed fingers are the most common abnormality of a newborn baby's hand. Webbed fingers can happen as a solo condition or they can be part of a syndrome that includes other abnormalities. Webbed fingers are fairly common, presenting in 1 of every 2500-3000 babies. Webbed fingers are seen more frequently in boys than girls and present more frequently in caucasians than asians or african americans. In about 50% of the time, both hands of the baby will have webbed fingers. Occasionally this condition can be picked up in a prenatal ultrasound, affording parents the opportunity to make a plan for this. Syndactyly can be complete (involve the hold fingers and nail) or incomplete (only involve part of the finger). Because webbed fingers are an obvious physical defect and can be a difficult condition in which to function, Dr. Bastidas believes that surgery to reconstruct webbed fingers is the best standard of care. Dr. Bastidas will do a thorough examination of a baby's hand in order to determine the best approach for reconstruction. Dr. Bastidas brings strong skills and a great deal of experience to the reconstruction of webbed fingers. He is a founding physician of the Institute of Pediatric Plastic and Craniofacial Surgery, a collaboration of physicians fueled by a passion for state-of-the-art care for their pediatric patients. Dr. Bastidas will do most surgical repair on babies with webbed fingers between the ages of six to twelve months and two years, based upon the complexity of syndactyly. If the thumb or the small fingers are involved (border digits), the first surgery will be performed at around 6 months. Otherise we often wait until 10-12 months for the first surgery. This is considered a good time for a baby to tolerate anesthesia well and the size of the baby's hand is optimal for surgery. If multiple digits are involved, Dr. Bastidas may do the surgery in several stages with time for healing in the interim. There may be skin grafting involved using tissue from the fold in the groin for this. Frequently Dr. Bastidas will place a cast on the baby in order to provide for uninterrupted healing. All babies are sent for physical therapy upon conclusion of the healing process in order to improve grip strength and range of motion. Dr. Bastidas takes great satisfaction from the results he delivers to his patients. He is passionate in his delivery of safe, high quality care and reputation for excellence is widespread. If you are seeking more information or treatment for webbed fingers, visit Dr. Bastidas' two websites: www.Dr.Bastidas.com and www.ippcs.org and contact his office. The team at Dr. Bastidas' office is committed to their patients and the delivery of world class care and patient experience.